That's kind of funny! I wonder if it was for "Camelot" but somehow snuck into this book! Also, your blog kind of makes me want to write random things on sticky notes and insert them into random pages of a book! Considering the book maybe the writer of he note is stating that she doesn't need a knight in shining armor to save her,to take care of her. I appreciate your blog,it lays make me mile. Considering the subject of the book maybe writer is saying that she doesn't need a knight in shining armor to save her,take care of her. I appreciate your log,always makes me mile. And it makes me SMILE, sheesh! Wow. I actually read this book some time back. 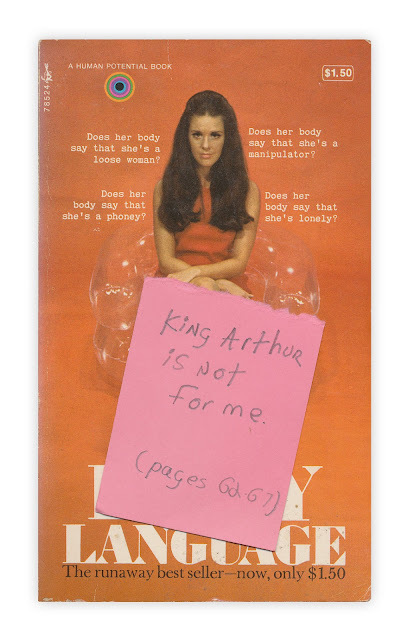 I don't remember even one reference to King Arthur, but maybe the association to the reader was much more obscure and personal.